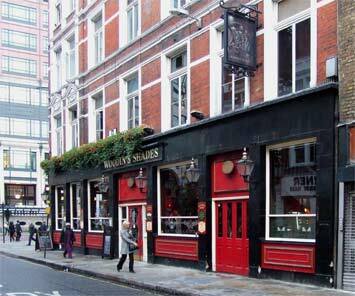 Across the road from Liverpool Street station on the busy Bishopsgate road the Woodin's Shades offers a reasonable pint of real ale for city works a the northern part of the City. Cash Marque accredited should ensure that the beer is kept to a good standard. There is an upstairs which has two pool tables, which is a rare thing in any pub in the City, especially on the northern side. The name Woodin's Shades' is derived from William Woodin who purchased the premises in 1863.